Giorgio Armani introduces four new Eyes to Kill Quad Shimmers featuring iridescent, eye-catching colors with electric shine and shimmer. The real innovation is in the formulation of the powder eye shadow: an intense formula melds perfectly with a satin, pearly veil, producing amplified light effects. 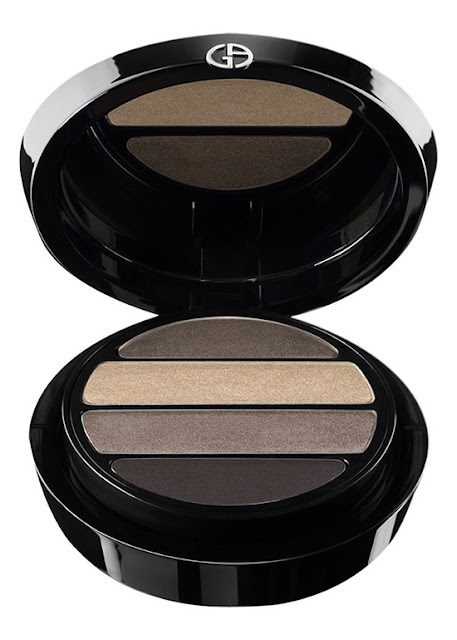 Irresistible with its extremely soft, sensorial appeal, the eyeshadow arms the eyes with a flawless weapon all day long. The moment that I saw Giorgio Armani Eyes to Kill 4 Color Eyeshadow Shimmer Palette No. 11 (Mystery) I knew that I had to have this gorgeous quad. The color story is a taupe-lovers dream come true. Mystery, or No. 11 as it is more frequently called, features four beautifully compatible shadows that are tend to lean a touch cool- but neutral enough so as not to dissuade those with warmer skin- tones from using it. Each individual shadow is finely milled, is easy to blend, and offers buildable color. This is quad is a stunning, extraordinarily high quality palette- just as one expects from Armani Beauty. The top shade is a stunning taupe with a hint of grey undertone. It has a lovely luminosity. The second shade is best described as a golden ivory with beautiful luminosity. The third shade is a stunning taupe with shimmer. The bottom shade is a nearly matte dark cool brown (and the perfect eyeliner!). This is without question my favorite neutral palette in my collection. It is elegant and sophisticated- yet infinitely wearable for any occasion. This might just be the perfect palette and if you love neutrals! If you generally find that most neutral palettes lean too warm for you-- then this is definitely the antidote to the standard warm palettes. Overall assessment: One of my all time favorite neutral eyeshadow palettes. From the quality to the colors themselves- this is one stunning taupe-lovers dream! $59.00 Available from Nordstrom, Neiman Marcus, Giorgio Armani, Saks Fifth Avenue & Bloomingdale's. (Affiliate Links). Stock Photo from Nordstrom. I stopped buying Armani palettes because the pigment was so disappointing but this looks beautiful. Is this a newer one? I love shades like this. I only have three Armani palettes, and all of them are the new ones. The pigmentation is lovely in all three of them. I have never purchased the older ones- and I have definitely heard others express their disappointment. These are lovely! Definitely worth going and looking at. Of the three that i own- I think this is the best for everyday use. I am very happy with it! Could you possibly do a comparative swatch of Chanel's prelude quad? Hi Hannah, I actually don't own Chanel Prelude Quad so I can't do a swatch comparison, sorry! They are definitely similar in that they are both cooler-toned neutral taupe palettes. Both are lovely! Hi Lexie- I agree! It's definitely my favorite of the 3 palettes that I bought from this release! Oh my goodness this is a gorgeous palette! So very pretty! Oh my goodness this is a gorgeous palette! So very pretty! Neutrals of the taupe variety that lean cool are just perfect in my book!